Tens of PAOK players have put on the Greece shirt since 1938. On 20 February 1938, in the encounter against Palestine in Leoforos Alexandras ground, goalkeeper Nikos Sotiriadis became the first Greece international of the “Double-Headed Eagle”. He came off the bench in the 15th minute to substitute Spyros Sklavounos who had started the match. That was the last-but-one encounter of Greece before World War II. After the war, the Greece national team played unofficial matches and Giorgos Mouratidis participated in one of them, against the Aviation team on 17 March 1948. 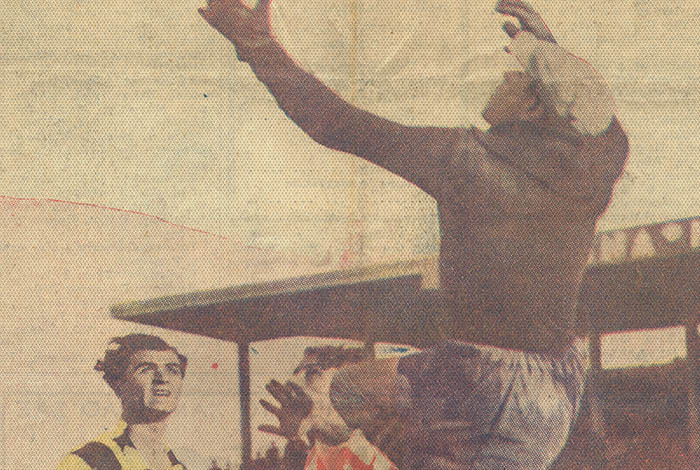 Eight months later, on 28 November 1948, Mouratidis played in the officially recognized friendly match against Turkey in Istanbul inaugurating the caps of PAOK players in the post-war era of the Greece team. The following years went by with some isolated calls. On 18 June 1971, there were two PAOK players in Greece’s line-up when they defeated Malta 2-0. Stavros Sarafis and Giannis Gounaris became the first duet of the “Double-Headed Eagle” in the national team. A few months later, the starting line-up of Greece in their 2-1 victory over Italy would feature three PAOK players: Sarafis, Koudas and Paridis. The trio evolved to quartet on 31 January 1973, when Koudas, Terzanidis, Aslanidis and Sarafis played for Greece against Bulgaria (2-2). On 1 April 1975, in the friendly 2-1 win at Cyprus, PAOK had five players in the Greece line-up: Gounaris, Pellios, Terzanidis, Anastasiadis and Paridis. On 4 June 1975, Greece defeated Malta 2-0 for the 1976 European Nations’ Cup qualifying stage. The match was held at Toumba and the local crowd was delighted to see five PAOK players in the line-up: Pellios, Iosifidis, Anastasiadis, Apostolidis and Aslanidis. The record number of PAOK players in a Greece match is six and it occurred twice, both times in friendly encounters: Cyprus – Greece 0-1 on 15 April 1981 (Gounaris, Iosifidis, Koudas, Damanakis, Orfanos and Kostikos) and Greece – Denmark 2-3 on 23 September 1981 at Charilaou (Pantelis, Iosifidis, Kostikos, Koudas, Damanakis and Gounaris). On 18 December 1999, the Greece team fielded five PAOK players for the last time up to date. In their 2-2 draw with Estonia at Trikala, the “Double-Headed Eagle” were represented by Stelios Venetidis, Giorgos Char. Georgiadis, Pantelis Konstantinidis, Kostas Fratzeskos and Nikos Froussos. Stavros Sarafis is the first PAOK player to put on the captain’s armband for Greece. It happened on 27 July 1969, in the friendly 2-0 win over Australia in Melbourne. The Caesar was the first Greek to step on the pitch that day. He went on to captain the national team four times in total –the last one in Warsaw, when Greece lost 2-0 to Poland. Seven more players of PAOK have been skippers of Greece throughout the years: Giorgos Koudas, Kostas Iosifidis, Thodoris Zagorakis, Kostas Fratzeskos, Giorgos Char. Georgiadis, Kostas Katsouranis and Dimitris Salpinigidis.